We want to offer a huge thank you to the 400 people who attended our 2015 Education Celebration and to all of our sponsors who made our evening a success! We enjoyed a fantastic and inspiring evening. Below is just a glimpse of some of the most memorable parts of the evening, thanks to M. Rinaye Photography. Our speaker for the evening, Steve Pemberton, author of A Chance in the World: An Orphan Boy, a Mysterious Past, and How He Found a Place Called Home, shared his story of overcoming adversity as a child. His message resonated with everyone in attendance and many left with the realization that each of us has the potential to impact the life of a child in a way greater than we ever realized. 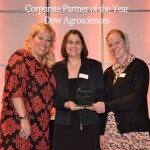 Dow supports our programs in a multitude of ways, including bringing Science Ambassadors to tutoring to provide children hands on science activities and helping us select the best way to incorporate science and technology through a generous grant. 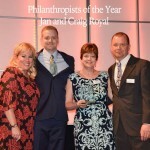 Jan and Craig have embraced the School on Wheels mission personally through gifts of financial and in-kind support, through their company that provides tutors, books, and school supplies, and through their family where son Dan has served as a volunteer tutor. 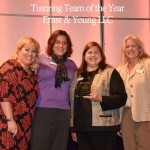 Ernst & Young has staff serving our students at both the Julian Center and Dayspring Center. Additionally, they led a backpack and gift card drive as a part of our 2014 #FallforSOW drive that pitted corporation against corporation in the spirit of helping the children in our city who need it the most. A former teacher, Rita believes we are all lifelong learners and has been a tutor since 2009. 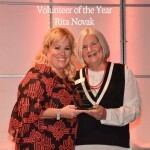 Rita goes above and beyond as a tutor and engages her family members as tutors, supporters and volunteers. She arranges field trips for our students and tutors at THREE locations every week. Dustin Ecker is a 2010 graduate of IUPUI and is currently a 4th grade teacher at Grassy Creek Elementary School in Warren Township. As a teacher, Dustin strives to reach out to families and build relationships that will extend beyond the classroom. 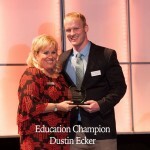 Dustin works year round to engage the entire family in his students’ academic success with impressive results. Dustin received a $1,000 award that will benefit the students with whom he works. School on Wheels youngest supporters were also honored at the event. Chase, a tutor for the past two years, and Robbie, who has donated his birthday for the past three years to raise supplies and support for our students, are amazing examples of how kids in our city are giving back in big ways. Emcee Rafael Sanchez even managed to get a picture with these young philanthropists. Thank you, again, to everyone who attended the event and helped us celebrate education and the accomplishments of our students, donors, corporate partners and community members. With your generosity, we were able to raise over $200,000 to support the academic intervention programs that assist Indianapolis’ most vulnerable children. Your support helps kids like Abby, a fifth grade student who was failing two classes during the first quarter this school year. But by quarter two, she raised her grades and is now passing all classes. Within one school semester, her GPA has increased from a 1.2 to a 2.3 and she continues to work hard and attend tutoring every week. And your support helps kids like Danny, who has attended over 120 School on Wheels tutoring sessions in the past year and a half. In that time he has improved his grades from straight Cs to now all As and Bs. This second grader currently has a 3.5 GPA, has Outstanding behavior, and has 100% perfect attendance so far this school year. The Education Celebration may be over, but there are many ways you can get involved! Make a contribution to help us provide programs to more students like Abby and Danny or apply to tutor next school year!